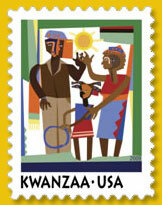 For the upcoming 2009 holiday season the US Postal Service has issued a new Kwanzaa Stamp. This is the 3rd design for a Kwanzaa stamp since the first was issued in 1997. The U.S. Postal Service celebrates Kwanzaa, a non-religious holiday that takes place over seven days from December 26 to January 1. Kwanzaa draws on African traditions and takes its name from the phrase for “first fruits” in Swahili, a widely spoken African language. Stamp artist Lloyd McNeill of New York City, under the direction of Carl T. Herrman, created this new, festive, highly symbolic design to celebrate the holiday. 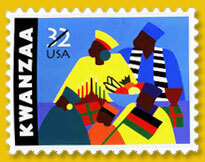 The bold colors in the stamp art are complemented in the top right corner by the colors of the Kwanzaa flag – green for growth, red for blood, and black for the African people – which are the same colors as the Pan-African flag. The field of green around the borders symbolizes growth and a bountiful harvest. In the hoop that the girl holds in her hands, as well as in the family grouping of mother, father, and child, McNeill symbolized unity. This is the third stamp design issued by the U.S. Postal Service in celebration of Kwanzaa. 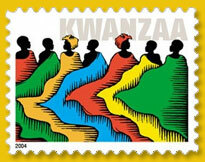 The first Kwanzaa commemorative stamp was issued in 1997.